Phuket has a great selection of sandy beaches, all of which are on the west coast stretching from Nai Harn Beach in the very south to Mai Khao Beach north of the airport. The east coast is tidal and although there are many lovely beaches, they are mostly unsuitable for swimming due to low tide and rocky conditions. Warning: During certain months (April to October), there are strong rip tides and the beach will show a red flag which indicates no swimming when raised. Many foreigners ignore these flags and drown every year. In addition, there are no lifeguards on duty, so be warned. This beach keeps quite a low profile as opposed to the famous beaches on the island. You can find this white powdery beach in the very north of Phuket, next to Mai Khao Beach. Surrounded by groves and pines, this picturesque stretch of sand is perfect for relaxing in peace and quiet. Surprisingly enough, this is the longest beach in Phuket. Situated in the far north of the island, this beach is also known as the ‘airport beach’, due to its close proximity to Phuket International Airport. 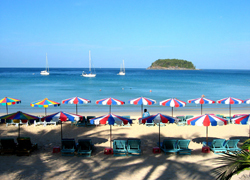 This beach is a typical northern Phuket beach, generally deserted and a great place to relax. Swimmers should be careful because of the steep slopes, which hold many unseen dangers. When people use the term ‘untapped’, they were thinking of Nai Thon Beach. This secluded bay clings to the south side of Sirinat National Park and is a thing of immense natural beauty. The beach is ideal for swimmers, not only because of the privacy you receive, but also because the bay is protected at both ends by granite outcrops that serve as a shield against the elements. Situated just south of Mai Khao Beach in the north of the island, Nai Yang is an isolated beach that is great to visit if you enjoy peace and tranquillity. Surrounded by tall pines that provide excellent shade, Nai Yang Beach is also famous for its nearby coral reefs and its sea turtle inhabitants. This is a great beach for exploration, families and picnics. 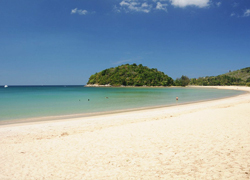 This wide-open stretch of sand is one of Phuket’s largest beaches. 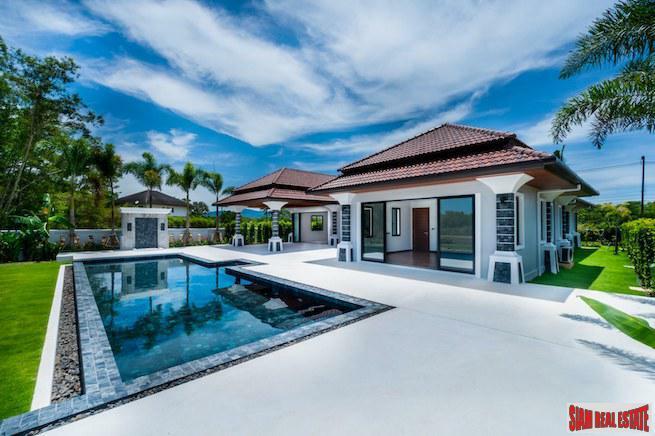 This former tin mining region has been transformed into luxurious beachside destination for tourists with its high-end properties, a world-class golf course and numerous five-star resorts. The beach itself is one of the busier on the northwest side of the island, but still relatively peaceful when compared to Patong and Karon Beaches. The Laguna Complex also shares this strip of white sand, which is an exclusive residential and beachside resort. 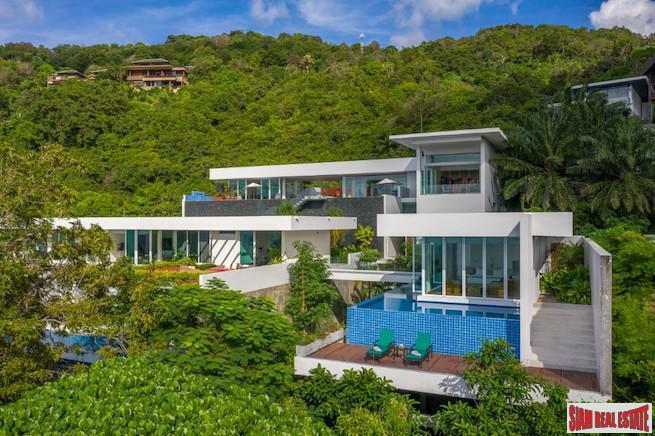 This region on the west coast of Phuket owns the reputation of ‘millionaire row’ due to its luxury sea-view properties. Surin Beach enjoys the shelter of casuarinas trees lining its coastline. This secluded and peaceful beach is a favourite with tourists in the know. This is a great spot for relaxing in the subtropical clime, however, be careful if swimming because the steep slopes can create unseen dangers with powerful riptides, especially during the monsoon season. 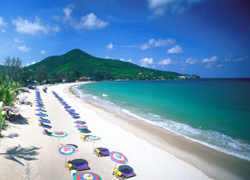 Surin Beach is also home to some great beachside restaurants such as the Catch Beach Club. On the west coast, just south of Surin, you can enjoy the relatively unknown Laem Singh Beach. 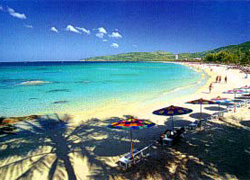 This small yet beautiful white powdery beach provides great respite away from the crowded tourist beaches on the island. Definitely a beach to visit if you enjoy relaxing in peace and tranquillity. 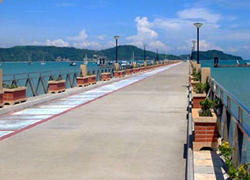 This two kilometre long stretch of sand is situated on the west coast, south of Surin and north of Patong. This is another relatively peaceful beach when compared to the major tourist laden beaches. Here you can enjoy a secluded afternoon sunbathing or relaxing in the nearby restaurants that offer great sea-views. Patong is Phuket’s number one tourist destination and you will notice this when visiting the beach. During the high season months (November to April), the beach can become very chaotic, but its unquestionable character keeps tourists coming back for more. 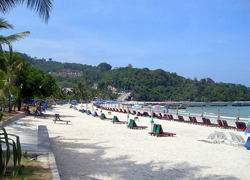 Patong Beach is one of the longest beaches on the island but also one of the most developed. This is a great thing if you feel like a coffee from Starbucks or a Big Mac, because all the major fast food outlets are positioned along its beach road. 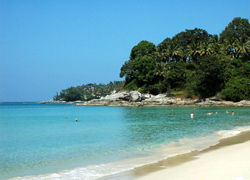 Karon Beach is situated south of Patong on the west coast of Phuket. This is one of Phuket’s most picturesque and longest beaches that benefits from mountainous sand dunes and a sprinkling of casuarinas and palm trees. Karon Beach is infamous for its violent riptides during the months of May-October, so one should be wary and keep a lookout for the red flags. Many people succumb to the riptides each year with high fatality rates, so please be careful. Surrounding Karon Beach is many restaurants, markets and bars you can take advantage of when visiting. 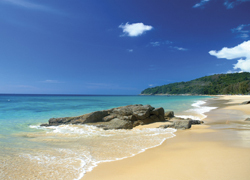 Kata Beach has to be one of the cosiest and idyllic beaches in Phuket. 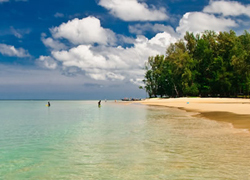 The beach is sheltered by tall palm trees and is great for snorkelling in the nearby coral reefs and observing the vast array of tropical marine life. This beach can get busy in the high season months over Christmas and New Year, but generally this is a nice beach to relax and unwind. There is also great surf at Kata Beach, where equipment can be hired from the shops adjoining the beach. 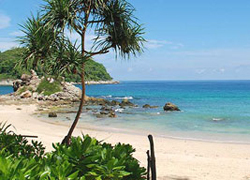 This beach is set in a quiet bay a short distance south of Kata Beach. This exclusive area owns some great five-star beachside resorts and is generally unvisited by tourist who do not stay at Kata Noi itself. This beautiful yet small stretch of sand is the reason why Phuket beaches are touted around the world as some of the finest. 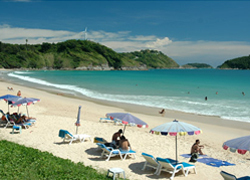 Lauded by many as the best beach on the island, Nai Harn Beach has a reputation that precedes itself. The beach is situated on the southwest coastline and is the proverbial sight for sore eyes. This picturesque stretch of golden sands and azure blue waters is the quintessential photograph opportunity – it really is that scenic! The towering jungle-laden mountains protect the beach from the elements, although the riptides can be quite dangerous from May-October. 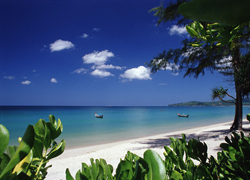 Adjoining this great beach are five-star resorts such as the The Royal Phuket Yacht Club. A children’s park and Buddhist temple are also within walking distance from the beach. This is quite possibly Phuket’s best kept secret in regards to beaches. You can find this rough diamond on the coastal road between Laem Phromthep Viewpoint and Nai Harn Beach. This is a very small stretch of sand, which is great for snorkelling on the nearby reef and relaxing in peace and quiet. Don’t tell everyone about this beach, keep it to yourself because the charm of the beach is what makes it such an interesting place to visit. Situated at the southernmost tip of the island, Rawai Beach is the home of the famous sea gypsies and some of the finest seafood restaurants on the island. Although the surrounding ocean and islands are great for snorkelling, fishing, boat tours and diving, the beach itself is not really sunbathing material due to its unkempt appearance. 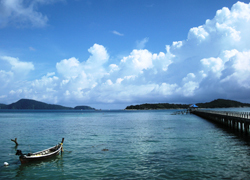 Rawai Beach road however, is a great place to relax in a bar and enjoy the outlaying islands. This is another beach that is off the beaten track and rarely visited by the tourist crowds. Halfway between Rawai and Chalong on Viset Road, you might find Laem Ka Beach if you are prepared to look. This hidden beach is privately owned but no one ever bothers you when visiting. 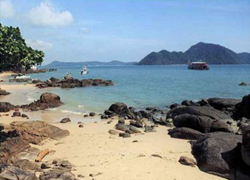 This beach is where you will notice the Thai families and couples normally go. Although the beach is approximately 400m in length, it owns great spots in the shade and a collection of small rock formations. 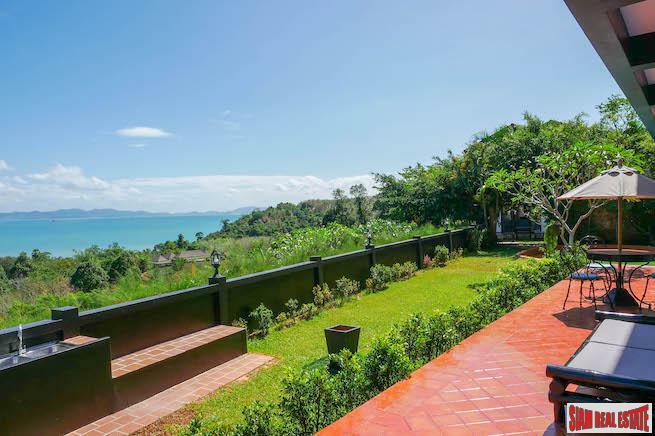 You can gaze out towards Lon Island and Chalong Bay in great privacy and seclusion. Chalong Bay is situated on the southeast coast of Phuket, owning a large pier where tour boats and diving expeditions are boarded. This isn’t a great beach for sunbathing or swimming, but taking a stroll along Chalong Pier always provides great views of the outlaying island. Within a short distance of the pier, you will find some high quality beachside restaurants and bars to enjoy.